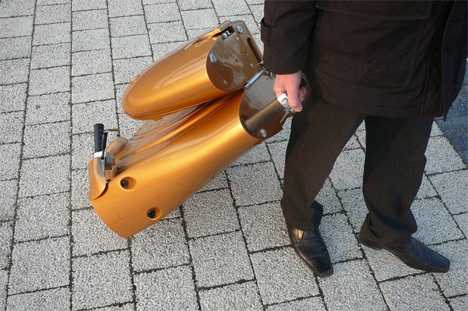 Fold-up scooters are becoming more popular than ever, but none of them are as good-looking as the MOVEO. 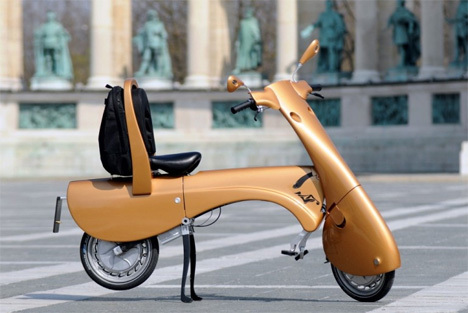 Developed by the Hungarian environmental non-profit Antro Group, MOVEO is an electric scooter with a motor in each wheel and a seat built right into its chassis. The MOVEO doesn’t require a parking space; rather, it folds up and can be wheeled along behind you using the built-in handle. It takes about two minutes to go from the driving configuration to its folded-up state. When folded up, the scooter is fully enclosed, meaning that all of the street-dirty parts are covered up so you don’t come into contact with them. 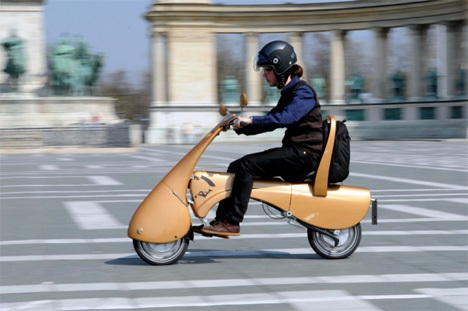 Antro Group says that the MOVEO weighs just 25 kg (55 pounds) and a top speed of 45 km/h (28 mph). It can go up to 35 kilometers (21.75 miles) on a single charge. Charging the battery from empty to full only takes an hour – pretty impressive for an electric scooter. 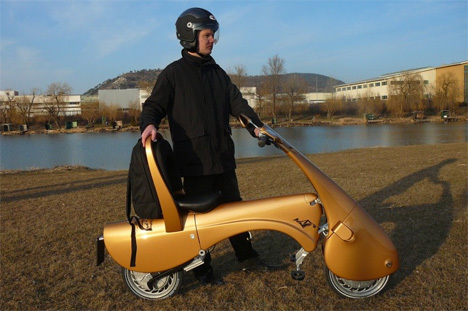 The sleek, ultra-portable scooter has been in development since 2008. The first models will cost between $3,100 and $4,600 (US), depending on whether the Antro Group gets enough funding for a large production run.